So much has happened already in 2019 that I can hardly believe it’s still only March! The year kicked off with our annual Burns Weekend in Bournemouth – a bumper turn-out of 200 Brethren and their partners. All the usual Scottish ingredients were in ample evidence including Tom and Eunice’s musical and vocal contributions, poking fun at current affairs and members of the Executive (especially the latter!). And of course there was my announcement – that I will be retiring as your Provincial Grand Master in July this year. The work of the Province, its Executive and the others who contribute so much has not slowed down however. The Chains’ Official Visits to our Lodges continue to attract large numbers of Provincial Officers in the Delegations and this support enhances our Lodge Meetings to a huge extent. Thank you to everyone who continues to show this level of commitment to the Province. I am also delighted to report that London Mark worked alongside our Companions from Metropolitan Grand Chapter by assisting in the running of a Chapter Awareness Event at MMH on 30th January. By way of further examples of ‘business’, February saw the Consecration of our second Turkish-speaking Mark Lodge, Namik Kemal; the Consecration of Centenary Royal Ark Mariner Lodge and a Full Team Visit to Panmure Lodge. All within the space of 5 days. This month we held an extremely successful Awareness Event within Orchestral Lodge and from that one occasion we have convinced some 12 Master Masons to be Advanced into our wonderful Mark Degree. Also we consecrated Aegean Royal Ark Mariner Lodge in our usual splendid fashion. Brethren of the Province I salute you for all the hard work you put in; not only in busy months such as these last few but all year round. In February at the Installed Masters’ Lodge meeting (yes, another day out!) I was delighted to be able to reveal the name of my successor. VW Bro. Tom Quinn, Deputy PGM, will take over from me on 11th July. 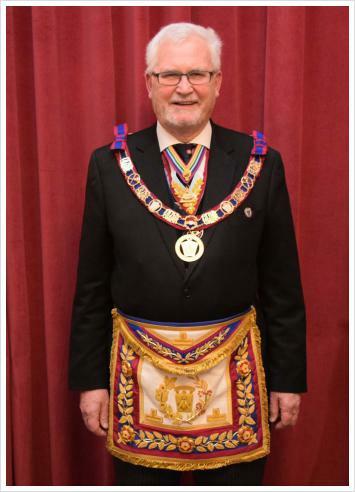 Tom has held active Offices since 2006 and, given his contributions to our social events, Delegations (attending and organising), visiting Lodges to help with Ceremonies, coupled with his appointment as Preceptor of the Grand Master’s Lodge of Instruction, he is a well-known and respected figure across our Province and beyond. I would urge you all to put 11th July in your diaries now and book in for our Annual Meeting to support the Investiture Ceremony at 10.30 for a prompt 11:00 start; lunch at the Connaught Rooms and then our regular Provincial Meeting afterwards. The day will be another milestone in London’s distinguished history – and of course the Pro Grand Master (our own Most Worshipful Bro. Ray Smith) will be the Installing Master. The Summons can be found here and the Dining booking form here. On the charity front, London continues to play a leading role. In addition to the monies raised at the Game of Thrones Party – just over £1,500; Burns Event – just under £3,000, and your generous purchase of the MBF badges (yes, Brethren those lapel badges!!) which has raised £10,000, the 500 Club has seen a real resurgence of interest under Marios’ initiatives. This year’s figure will be revealed at the Stewards’ Lodge Meeting on 6th June. If you are not already a member (a number costs £12 pa and could net you £500 in prize money) then please contact your Lodge Secretary or Charity Steward – they have all the details. The coming few months before my retirement date will not see any let-up in activities. Tom and his new Team are busy planning the 2019/20 Season and arrangements are well in hand for the formation of a Mark Lodge for Railwaymen. Any Mark Master Mason who has been connected with the rail industry in any way is invited to become a Founder and meet with friends old and new in an environment where they have more than Masonry in common. As usual, all the info is available on our website. Also in the early stages of organisation is a new Lodge for rugby enthusiasts – “Spirit of Rugby Lodge of MMM”. If you are interested and would like to share in the honours of becoming a Founder, then contact Tom or myself and we’ll put you in touch with the Organising Secretary. Brethren all, this is not my last “PGM Writes”. You will hear from me again before July so that I can send you a final huge thank you for all the support you give to our wonderful Order in Freemasonry and London Province in particular. In the meantime I wish you well and hope that the GOOTU will take care of you all.